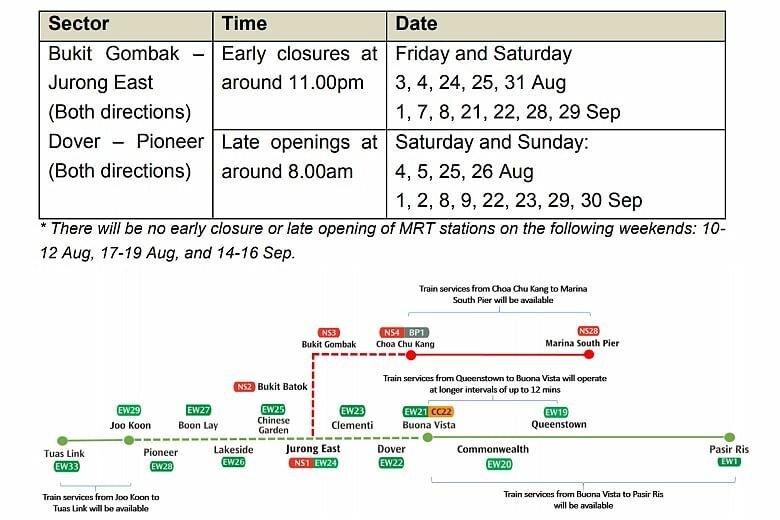 SINGAPORE - Commuters taking the North-South and East-West lines will have to contend with shorter MRT operating hours at 10 stations during selected weekends in August and September. This brings a programme that started last December - to close selected stations earlier and open them later - into its 10th month. This is to facilitate track maintenance and upgrading works, and to test a new signalling system on the East-West Line (EWL) before it was deployed in May. Announcing the details on Wednesday (July 18), rail operator SMRT said affected stations this round include seven stops on the EWL, from Dover to Pioneer, along with three stations on the North-South Line, from Bukit Gombak to Jurong East. These 10 stations will close earlier at around 11pm on selected Fridays and Saturdays, and open later at around 8am on selected Saturdays and Sundays. On normal days, trains run from 5.30am to about midnight. There will be no early closures or late openings on the following weekends: Aug 10 to 12, Aug 17 to 19 and Sept 14 to 16. SMRT said train service between Buona Vista and Queenstown MRT stations will, on the affected weekends, operate using a single track, as a bi-directional shuttle service. Trains will arrive at longer intervals of up to 12 minutes. As part of this arrangement, east-bound commuters will have to change trains at Queenstown MRT station to continue their journeys. Train service from Choa Chu Kang to Marina South Pier MRT stations, and from Joo Koon to Tuas Link MRT stations, will be unaffected. Bus shuttles will be deployed to help commuters get around during the shorter MRT service hours at the 10 stations. One service will ply between the affected stations of Buona Vista and Joo Koon, while another will ply between Choa Chu Kang and Jurong East MRT stations. In addition, there will be an express bus service to complement the shuttle bus service during the late openings on Saturday and Sunday mornings, SMRT said. This express service will offer two direct trips from Boon Lay MRT station to Jurong East and Buona Vista MRT stations, and make two direct trips from Buona Vista MRT station to Jurong East and Boon Lay MRT stations. Commuters are advised to check SMRT Trains' website and social media platforms when planning their journeys.